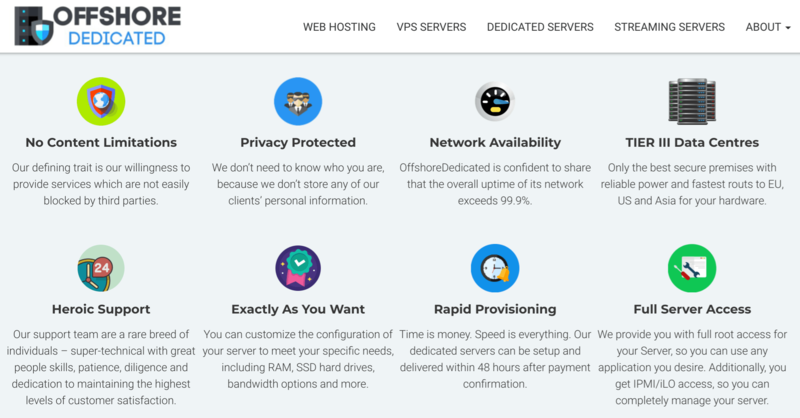 OffshoreDedicated Review 2019: Is OffshoreDedicated a Good Hosting? 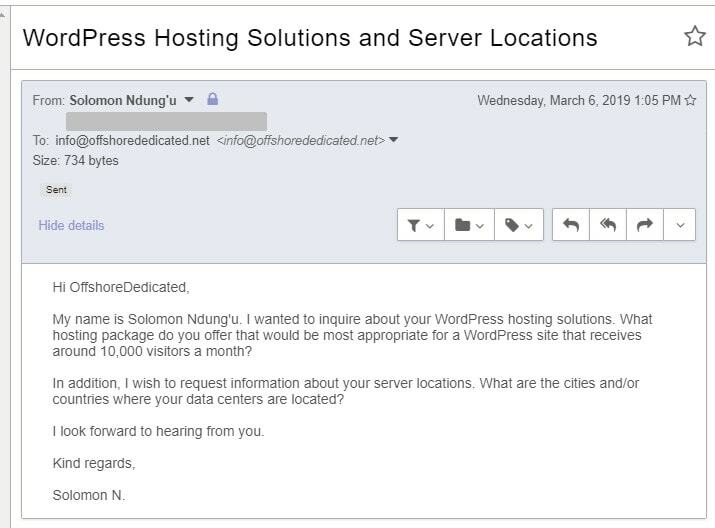 OffshoreDedicated is a Bulgaria-based web hosting company that boasts about its DCMA-ignored “offshore” hosting accounts letting you host any content as long as it’s legal. Established in 2013 in Bulgaria, OffshoreDedicated’s hosting solutions are characterized by high performance and network availability. This vendor has multiple data centers in Europe and Asia, which provide the backbone of its offerings that include offshore shared hosting, VPS hosting, and dedicated servers. OffshoreDedicated mainly targets businesses in Bulgaria, but it also has a notable presence in Russia, Poland, and Switzerland. The shared web hosting solutions come in four packages: Seedling, Bonsai, Karri, and Sequoia. The most basic offshore shared hosting plan is Seedling, which includes 2 GB SSD storage, 1000GB monthly bandwidth, 2 add-on domains, 5 MySQL databases, and 5 email accounts. The most advanced plan is Sequoia, which comes with 20 GB SSD storage, unlimited monthly bandwidth, 20 add-on domains, unlimited MySQL databases, and unlimited email accounts. Clients can customize the configurations of their servers to meet their specific needs. Some of the possible configurations include RAM, bandwidth, and SSD storage. OffshoreDedicated performs weekly off-site backups, with data stored on a remote server to ensure that systems and servers can be reloaded with the latest data following of a disaster, accidental error, or system failure. Also, this provider uses top-grade hardware for its servers and network, so that it can offer a 99.9% uptime guarantee (which is a bit below the industry average). Servers are housed in Tier III data centers located in Poland, Bulgaria, Switzerland, and the Netherlands. The data centers are in secure premises with reliable power and multiple redundant routing to Europe, the U.S., and Asia. This provider’s U.S. dollar-denominated hosting plans are a bit expensive. They are offered on flexible billing cycles with monthly and quarterly subscriptions that include a 15-day money-back guarantee (but only for shared hosting services). There is no money-back guarantee for VPS and dedicated server solutions. Customers can contact OffshoreDedicated’s 24/7 technical support team via telephone, ticketing system, email, or live chat. Unfortunately, the live chat is often offline, and my exploratory email went unanswered. This wouldn’t be so bad if there were decent self-support resources, but the knowledge base is empty and the blog is bare. As its name suggests, OffshoreDedicated is dedicated to providing “offshore” hosting accounts. What this means in practice is that the Digital Millennium Copyright Act (DCMA) ignored plans allow you to host pretty much any content as long as it’s not illegal. This vendor is let down by its lackluster support. Host any legal content on customizable servers with OffshoreDedicated. Wondering how OffshoreDedicated stacks up against other Web Hosting companies? Enter any other Web Hosting company and we will give you a side-by-side comparison.